This issue features the resolution of Amethyst’s battle against the Emissaries of Varn and Prince Carnelian’s most hilarious comment ever. 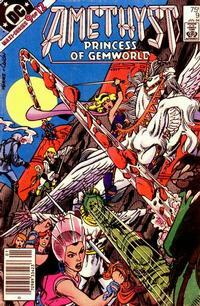 The cover shows Amethyst battling the trio from Varn from her winged unicorn. 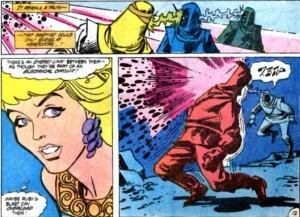 Lord Garnet is being attacked and Lady Moonstone looks irked which is understandable since her husband was swallowed in the last issue. Marion and Herb Winston sit alone in their house. Marion is on the phone with Amy’s friend Rita, saying that Amy is still visiting her “Aunt Esther”. Marion hangs up the phone and comments that Herb hasn’t touched his food. He’s too worried about Amy to eat. Back on the Gemworld, he Diamond Priest who suddenly appeared looks as though he is crazed with magic. Now that everyone in his house is dead, he is the sole conduit for all their power. He vows that the House of Diamond will be avenged! The Emissaries of Varn take a moment to confer and Amethyst’s allies think they have to press the attack. Amethyst wonders if the Diamond Priest is as powerful as he says, and he claims that he has power because he alone wields the pure magic of the diamond. He blasts the Emissaries of Varn. They absorb his magic and do their usual regurgitating rock trick, blasting Amethyst and the other nobles with a stream of rubble. I think you would not want to be around the Emissaries of Varn if they’ve been drinking too much. I hate to think of what they might vomit up if they’d been downing Thunderbird. Amethyst tries to get a shield up and Garnet fights back. Unfortunately his sword is swallowed up too. 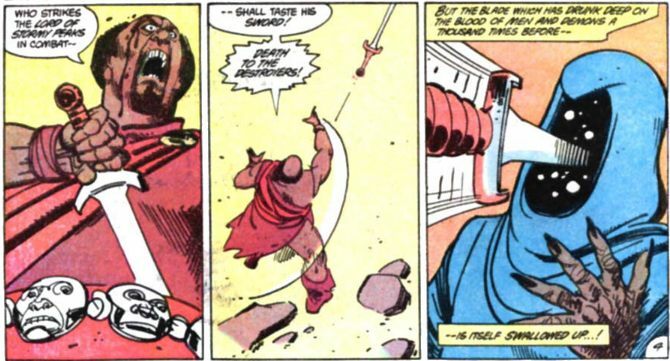 The Blue-Cloaked Varn man spits the sword back, point first. It heads for Garnet with incredible speed, but Topaz knocks Garnet away. Topaz is cut by the sword instead and Turquoise rushes to his defense by slicing off the Emissary’s claw. Unfortunately the Emissaries have claw-regenerating abilities and the hand grows back in seconds. 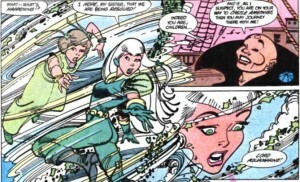 Blue-Cloak sends Turquoise flying, but Amethyst grabs her with magic before she can be injured. The Emissaries bury everyone under a pile of rubble. The Emerald Princesses have set out on their journey to ally themselves with Amethyst. I’ll just call them Princess Emerald and Emmy, even though the youngest princess doesn’t get her nickname until much later. They talk about their sick mother. 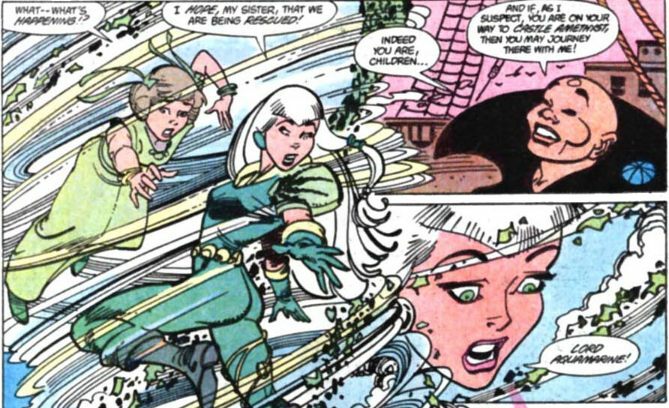 Princess Emerald says that they must do what their mother is too sick to do – represent their house by joining Amethyst. They come to a river where the bridge is washed out. The Princess Emerald doesn’t want to deplete their magic by using it to cross the river. Emmy decides to ask some nearby faeries for help. She calls to them and they start building a bridge of flowers. Princess Emerald envies the unique “green magic” ability that Emmy shares with their mother. This ability doesn’t end up being so handy after all, because faeries are notoriously flakey. The insects that live in the flowers used to build the bridge start to encircle the princesses, trapping them. Fortunately Lord Aquamarine is sailing nearby and decides to investigate the commotion. He uses his power to create a water spout, washing the insects away. Lord Ruby decides to act. He grabs his stone and rises to the top of his house, letting loose an intense beam of read light that burns away the rubble burying Amethyst and her allies. She’s kept everyone safe in a handy magic purple bubble. 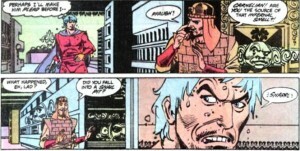 Lord Ruby blasts the Emissaries and Amethyst is reminded of something from junior high science class. The ruby light reveals that there’s an energy link between the Emissaries like an integrated circuit. Amethyst wonders if Ruby will be able to overwhelm them, but they promptly drain Ruby’s power and he collapses. 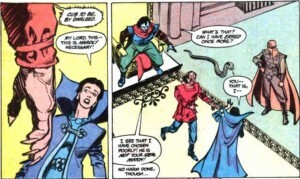 Back in his fortress, Dark Opal is very distressed that is efforts in matchmaking for Lady Sapphire didn’t work out. She keeps telling him not to worry about her love life, but he doesn’t want to break his promise that he’ll find her a husband, so he introduces her to a deformed sub-human fellow with inferior enunciation capabilities. 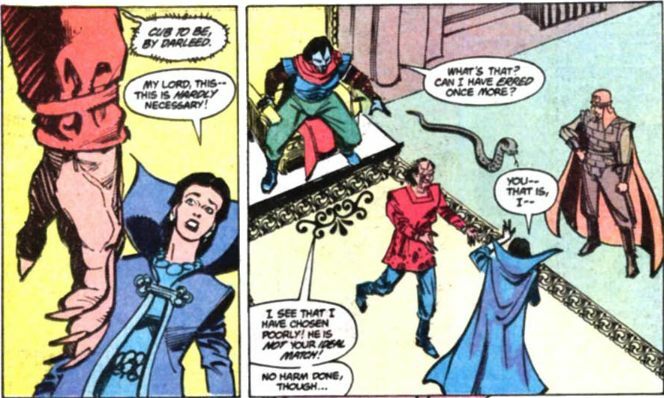 Lord Opal says that he can see he’s chosen poorly and he vaporizes Lady Sapphire’s would-be suitor. Opal says “Never fear Sapphire, I will scour the universes to find the man for you!” Sapphire says “Ulp” in reply. 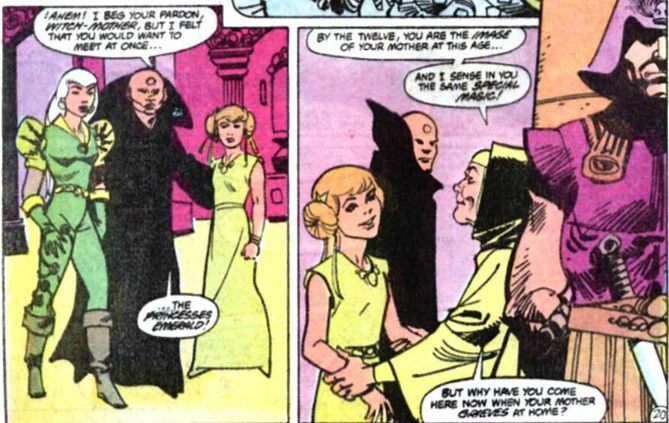 I’d be saying “Ulp” too, if Lord Opal was my matchmaker. I somehow doubt that he’ll find a mensch for her to marry. 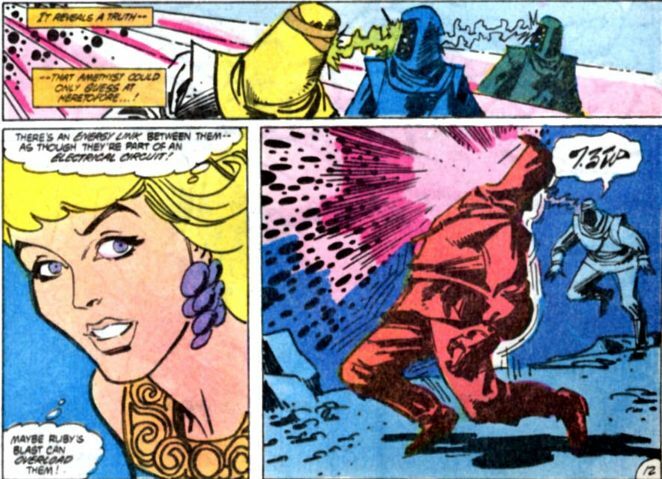 Since one of the Emissaries swallows up energy and the other spits everything out, Amethyst has everyone focus their energy on the one Emissary that doesn’t seem to do anything. Her strategy works, and the Emissaries start to flee back to their strange dimension. Before they disappear entirely, Amethyst spots Lord Moonstone floating in the darkness. She grabs his hand before the portal closes and Topaz and Garnet pull Amethyst back, liberating Moonstone from the dimension that is connected to the Varn trio. Citrina has been watching everything from the Well of Vision, and she’s delighted in how well Amethyst did against the Emissaries. Citrina sees another vision, this one is of Dark Opal seeking to augment his power by stealing the amethyst in order to create his magic breastplate. She puts her visions aside because the Emerald Princesses have arrived. Prince Carnelian is chasing the dragon with the amethyst fragment. His insults don’t seem to be having the desired effect. He tells the dragon that when he said “Overgrown Lizard” he meant it affectionately. And that exchange is why I have a soft spot for Carnelian even though he is a total ratfink. I mean, growing up as Dark Opal’s magicless adopted son with only an occasional demon whelp and a pet snake for company has to be tough. 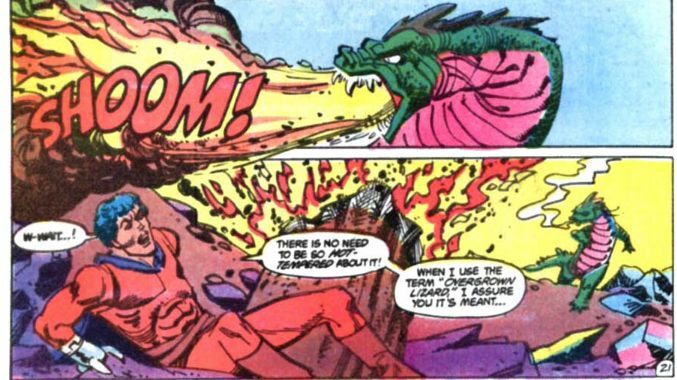 The dragon drives Carnelian off a cliff, into an extremely smelly snail pit. 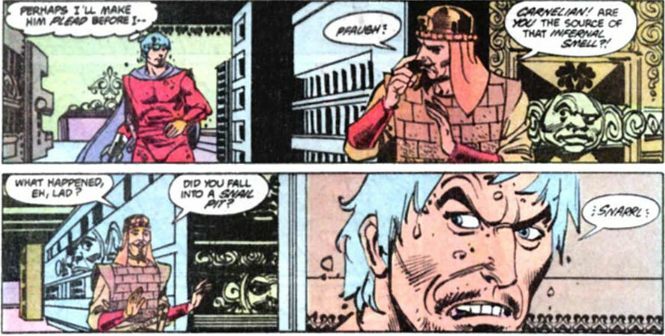 Carnelian returns to the fortress without the stone and Sardonyx comments on the stench. This entry was posted in comics and tagged Amethyst Princess of Gemworld on 7/7/2008 by Anna.